My Piano Coaching Program at PianoCareerAcademy.com Is Officially LIVE! After about 2 months of intensive configuring, tweaking and testing, I’m happy to announce you that my Piano Coaching Program at PianoCareerAcademy.com is finally LIVE!!! If you want to find out more about the functionality of PianoCareerAcademy.com, read our super-detailed FAQs! Improving your piano skills does not having to be a boring, frustrating process! It can and should be fun, exciting, fulfilling and motivating – and this is what we’re going to do on PianoCareerAcademy.com! Also, every piano student deserves to have access to professional piano playing secrets – no matter if he/she is a professional or an enthusiast who simply wants to explore the amazing possibilities of this instrument. Have you ever wondered why so many piano students are struggling in their daily practice, being forced to cope with low productivity, tension, an ugly sound, lack of expressiveness, hand injuries (and many other unpleasant piano-related problems)? The reason is simple: they lack correct information! The consequence? Incorrect, tensed, mechanical practice! Doing the right thing at the right time! Simply learning a set of general piano practice rules is not enough if you want to see a massive improvement in your playing. Yes, only knowing these rules can change the quality of your playing for good – but wouldn’t it be great to learn HOW and WHEN to apply them? On PianoCareerAcademy.com, I will tell you HOW to practice, how MUCH to practice, WHY certain tricks and techniques work, WHAT is appropriate for your skill level, WHEN to apply a certain practice method, when to take a break and so on! Each one of you deserves to have access to professional piano advice and to correct information! Why struggle, wonder or hope for ‘good luck’ when you can simply KNOW what do to, HOW to do it and WHEN to do it? In the Members Area at PianoCareerAcademy.com, you will have interactive access to correct information, to those shortcuts and secrets that will transform each practice session into a productive, enriching, empowering experience! PianoCareerAcademy.com will take further my intention of sharing with you my holistic perspective on music and life; of ‘disclosing’ the secrets of the Russian piano school; of helping pianists of all ages and skill levels improve their playing; and, the most important thing – of helping you find joy, balance and fulfillment in your piano practice! Don’t settle for old unproductive and boring piano practice routines! Take your playing to a new quality level, learn, grow, explore, enjoy! It’s a whole new musical world out there waiting to be discovered – are you ready to take the first step today? And one more thing, a very important one: I will continue to publish new free video and written tutorials on PianoCareer.com, so stay tuned! Follow me on Facebook, Twitter or Google + (and now also on Pinterest!) to get instant updates, support and motivation! WHAT WAS HE THINKING? HAVE ALWAYS WONDERED? MOZART…SONATA IN C MINOR, LAST MOVEMENT THEME. I AM NEW TO THIS SITE….WHAT A WEALTH OF KNOWLEDGE THAT GOES WAY BEYOND HITTING THE RIGHT NOTES. EXCELLENT! I’m replying with some delay to your comment because I’m busy with my new Piano Coaching Program at PianoCareerAcademy.com – there are so many exciting questions on the forum! The most important thing in musical performance is the artistic message of the piece – its meaning, its dramaturgy! Without meaning, without a message – what’s the point of all the technical tricks? Developing a brilliant piano technique without learning how to play expressively is like learning how to speak very fast without having something to say! Mozart’s Sonata in C minor K. 457 is indeed an amazing work full of bright contrasts and it has a very interesting dramaturgy. By the way, did you know that Mozart had an operatic/symphonic thinking? It means that when writing a piano piece, he was imagining the sonority of an entire symphony orchestra + the voices of the singers! In playing his works, we have to keep this in mind all the time! Have an amazing day and a productive practice! I like your program. But i have not enough money to join your program. I’ll send you an email soon (hopefully tomorrow) – explaining what you can do in this case. P.S. 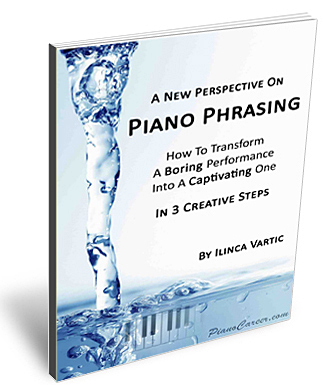 By the way, did you know that you can get a 10% discount if you subscribe to my email newsletter (and you’ll also get a free copy of my report ‘A New Perspective on Piano Phrasing‘)? I just tried to send you an email, but it seems that the address you provided while writing this comment is not valid. Could you please tell me your email address? Then, I’ll be able to let you know what you can do next ;). First of all, I have to mention that (even if I understand a little Spanish) all the tutorials on PianoCareerAcademy.com are entirely in English. The 50% lifetime discount was available only for those people who pre-registered before the launch of this project (on February 15th 2012). Unfortunately, that coupon code expired a long time ago! However, I can still share with you a discount coupon code that will help you to save 10% of your first membership fee (monthly OR yearly!) ;). Let me know if you would like to receive the coupon code – and I’ll send it to your email address :). I send you an email but fail. It appears that your email box is full. Are you still in business? The best way of contacting me (besides writing here on this site) is through the Contact Form on PianoCareerAcademy.com. I subscribed to your website but I am unable to get that ‘free copy’ of your book called: Piano Phrasing because I got a ‘Mail Delivery Failure’ when I emailed you. Could you please send to me as well? Were you suggesting in your blog, that the best way to help an early piano beginner (or even intermediate student) to de-memorize his/her notes and encourage score reading, is the using some of Bach’s inventions to play by reading?? Or which other methods would you encourage for ”memorisers” to look into the reading notes, (not using the ”auto-pilot” brain function) apart from placing a ”scarf” on your hands while you play? By the way, you didn’t have to email me after subscribing – the report can be downloaded by following the link from the Welcome email that you received after confirming your subscription. You can find detailed tutorials about correct memorization, mindful practice (as opposed to mechanical practice) and correct sight-reading on my Piano Coaching Program at PianoCareerAcademy.com. By the way, Bach’s Inventions are NOT a good a sight-reading material for beginners! They are too complicated for this level, being usually played after at least 4-5 years of regular correct practice. Hello. I meet you in youtube and liked vey much, Im writing you because Im taking piano lessons by the trinity school method (I prefer the conservatory but dont have money and I fact Im umployed for many years and Im making a great effort by investing in piano lessons), but Im having a great dificult in “talking” and feeling to the piano, I do not feel that harm weigth stuff and thats (besides I saw a video of an exercise of an experient person wich let me to do it very wrong puting a lot of stress in the fingers and get a king of tendinitis at least I get sometimes pains in my index finger) and I because I play with the fingers reagerding to the harm weigth I get a lot o stress in the finger leading to some pain, my I play almost p (piano) have dificult in the dymanics, Im very sad because the first time I dedicated real for music I get ghis problems, my teacher (I have lessos for 2 months) put me to play things of the 1º and now 2º grade because I allready know some music (I play bass, a bit of guitar and other stuff, but Im a bass player) so is ther any way you could help me is ther any advise, I could try your method for a month just to see if I get any diferent results but online lessons for some things like phisical things maybe be not the solution, advise please. Regards. Yes, you will definitely benefit by following Ilinca’s online lessons! Feel free to join for a month only – and then you can decide if you wish to continue your membership or not. Membership fees recur automatically until cancelled (as explained in our FAQs, question No. 6) – so if you wish to leave after only one month, you have to let us know in advance. In the Members Area you will find plenty of video and written tutorials on the topics that interest you (whole-arm action, weighted playing, relaxed ergonomic technique, how to avoid pain and hand injuries) – not to mention that all these fundamentals are explained from scratch, in a progressive manner, in Ilinca’s step-by-step Video Course for Beginners. Find out more about this Course (and about the functionality of our PianoCareerAcademy) by reading our super-detailed FAQs. Please pay special attention to questions No. 17, 1, 2, 3). what i should to do in the first time playing piano? You can learn how to play piano from scratch, in an enjoyable progressive manner, by following my step-by-step Video Course for Beginners (available in the Members Area of our site). This Course will help you to develop ALL your piano skills (technique, expression, hearing, reading, theory & analysis, pedaling etc.) in a harmonious manner, according to the professional system used in the Russian piano school. Find out more about this Course (and about the functionality of PianoCareerAcademy) by taking a look our super-detailed FAQs. No. 18: dedicated to learning musical notation. If you have other questions about the functionality of PianoCareerAcademy.com (that are not covered in the FAQs), please don’t hesitate to ask!